So this artist has displayed a real cow head(a decaying one), with maggots around it, in an art museum. IS THIS ART? Well, it is a controversial topic. Personally, I find this work disturbing and hard to accept, but some people may think that this is creative. To me, displaying dead animals is not what I will call art. Number 2, the display of a dead cow's head is gruesome and bloody. Number 3, the thought of using maggots(which transform into houseflies) is kind of freaky. I think the reason that we find some pieces of art controversial is because of our mindsets and our attitudes. For example, now we can accept the Impressionists' paintings. However, during the Impressionists times, people had this mindset that art should be like the Old Masters' art, so they deemed Impressionistic paintings as controversial art. This made me ponder over the term 'controversial art'. What exactly is controversial art? The idea of controversial art seemed to change as time progresses. 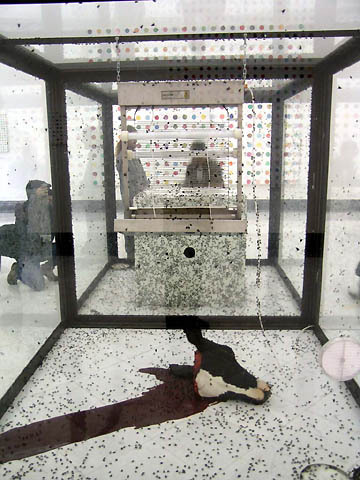 I wonder if an AEP student studies Damien Hirst in the year 3000, will she still find this work controversial? Or will new artists who challenge the notions of existing art be the next generation of controversial artists?